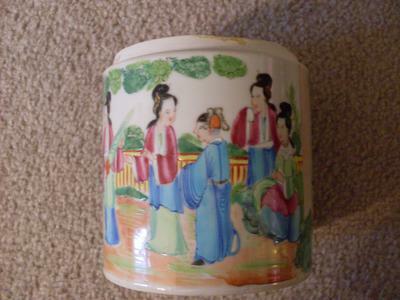 This is export porcelain, late Qing dynasty, in my view. The body is obviously old. Would need closeup pictures (very close) showing small parts of the decoration. The clothing of the man and the window would be of special interest. While this looks old, I have seen a vase with exactly this type of decoration, which seemed to have been repainted. As it had been repaired like yours, there is a chance that the painted decoration is not original. Would need to check that. Thank You Peter for all your help. I tried to get best close up I could get with my cheap camera. What does it look like it's been repaired with. And I'm sure that really affects the value. I can only say that it looks like, or is in the style of, a 19th century item. Personally I think it could be mid 19th century (the painting style only), if old. 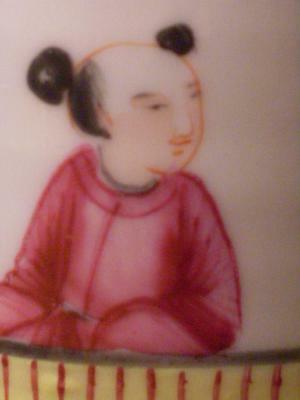 That is my personal opinion.. With late Qing dynasty we mean Daoguang~Guangxu reigns. 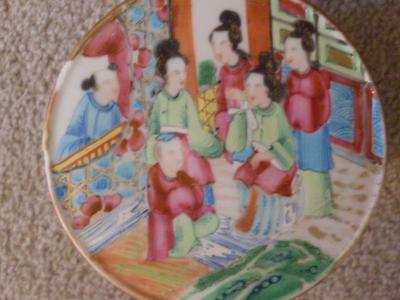 Basically, we here consider later painted items to be of the period the last painted decoration is made. Some old, plain items are overpainted to make them appear more valuable. 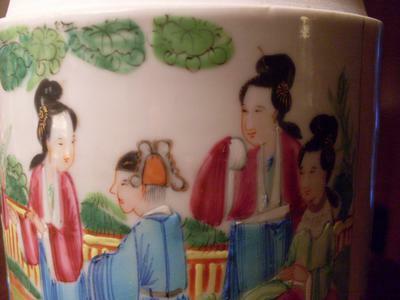 Painting on an old porcelain body at a later date can also be considered faking. Depends on the view someone takes. 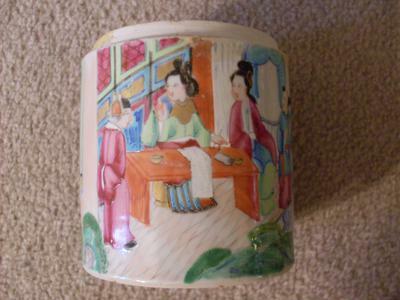 For example, I consider my vase 20th century although the style of painting points to 19th century. 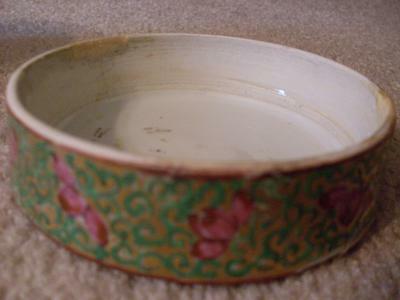 Ignoring that an item is partially made with (newer material=chemical paint) does still not make it antique, but it can be a nice handpainted craft item. Don't take me wrong, but I don't want you to think that if something was made over a long period of time (finished much later) it dates from the time it was begun. 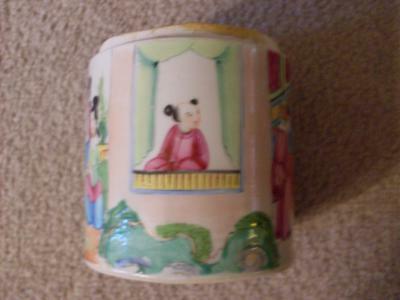 For example, we do encounter 19th century porcelains that used a porcelain body made in the 18th century, but that was painted only decades later. Probably in storage somewhere for a long time. The item is still 19th, not 18th. Another example would be jade: we consider jade carved in the Qing dynasty as being Qing dynasty, and one carved a few years ago as new, although they may have come from the same stock, even from the same stone, that is millions of years old. A hands-on inspection could clarify if yours is painted in the 19th or 20th century. 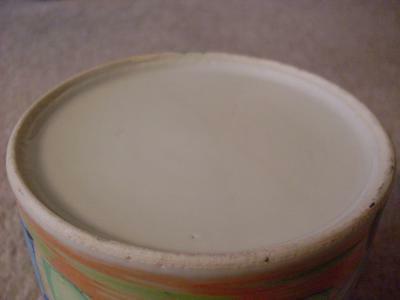 Hi Peter, So what you are saying, it is a 19th century jar with a later date paint? And if it is a 19th century would it be early or late 19th. THANK YOU for all your help you have given me. I had hoped for much closer pictures. So close that any pores or minute blemished can be seen clearly. If you cannot photograph closer, the only way is to have an experience collector do a hands-on inspection. 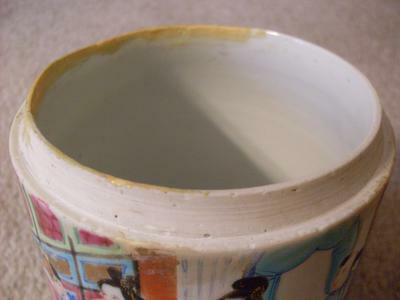 The top rim of the jar (the yellow part) was obviously repaired. 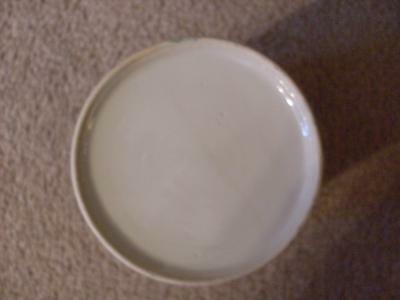 Sometimes items are repainted at the time of repairs. The decoration looks a bit too fresh for an item of that age. While the decoration should be 19th century, it shows no major abrasion of the gilt, and the colors look too fresh and bright, too perfect for an antique. The old ones would have been painted with mineral paint, but these look more like the later chemical paint to me. 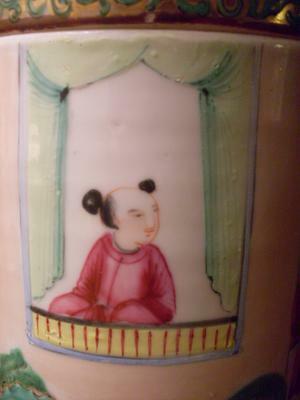 I have a vase with an invisible repair, which is the same decoration style and colors, also with gilt in the hair, etc. Yours looks as if it was repainted in the very same style, in these pictures.